La Aroma de Cuba was first relaunched in 2003 by Ashton, which secured the rights to the old Cuban trademark. Back then, the line was made at the Flor de Copan factory in Honduras. But starting in 2008, Ashton partnered with Pepin to revamp the line. The first Pepin-made La Aroma was the Edición Especials, introduced at the 2008 IPCPR Trade Show, with the revamped regular La Aroma blend debuting the following year. In 2010 came the Mi Amor line extension, followed by the Mi Amor Reserva in 2012. We’ve reviewed every blend in the line (including the pre-Pepin original), except for the newest, the Noblesse, which debuted in 2014. Over the years, Ashton has added two new sizes to the blend, which is produced each year in limited quantities. Like the others it’s made at Pepin’s My Father Cigars factory in Nicaragua. For this review I smoked the Regency, the robusto-sized (5.5 x 50) follow-up to the debut Toro size. Far from the discount origins of the line, it’s a premium-priced offering that will run around $13 per cigar. The cigar features an Ecuadorian Habano Rosado wrapper around dual Nicaraguan Habano and Criollo binders. The aged filler tobaccos reportedly use tobacco from the Garcia family’s farms in Estelí, Jalapa, and Namanji. The cigar starts out with roasted cashew, cedar, and leather notes. There’s plenty of spice with white pepper and cayenne, and a finish that includes wood and slight citrus peel. This is a full-flavored cigar with plenty of spice. Smoked slowly and it will show some balance, but when rushed, even a little, it quickly develops slightly sour notes. The draw was overly tight on one of the samples I smoked, but otherwise the combustion was solid, if not excellent. I’ve been a big fan of La Aroma de Cuba over the years, but I have a hard time recommending the Noblesse over the earlier and more affordable blends in the line. 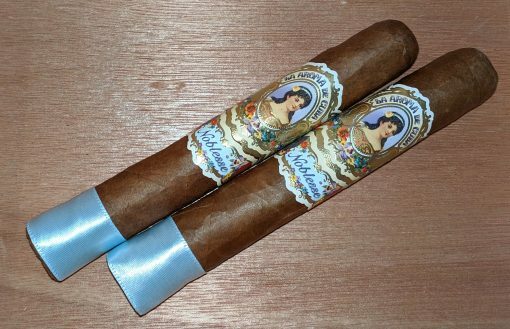 Still, the Noblesse Regency is a solid and enjoyable offering that earns three and a half stogies out of five.